Die byzantinischen Bleisiegel bieten jenen Quellenbestand zum Gesamtphänomen Byzanz, der auch heute noch die bedeutendsten neuen Informationen bereithält; einerseits ist viel Material noch unpubliziert, andererseits sollte man in vielen Fällen besser nur von einer Erwähnung oder Voredition sprechen; kaum ein Drittel der etwa 80.000 erhaltenen Bullen ist gut aufbereitet. Vom systematischen Katalog der byzantinischen Siegel in öffentlichen und privaten Sammlungen Österreichs ist 1978 ein erster Band erschienen, der sich mit dem Kaiserhof in einem weiten Sinn befasste (Kaiser, kaiserliche Familien, Funktionäre des Hofes und Rangtitel). Der nun vorliegende zweite Band ist der Zentral- und Provinzialverwaltung gewidmet, sowohl auf dem militärischen als auch auf dem zivilen Sektor. Nicht nur verwaltungsgeschichtlich, auch prosopographisch bietet er viele neue Erkenntnisse. Um dem Ziel weiterer methodologischer Fortschritte insbesondere bei der Frage der möglichst engen Datierung sowie allfälliger Identifizierungen näher zu kommen, wurde vor allem im Kommentar viel zusätzliches Material herangezogen, so dass über tausend Siegel bearbeitet wurden, entsprechend den Möglichkeiten und Grenzen der modernen Sigillographie. Byzantine lead seals serve as a major source of information for the overall phenomenon “Byzantium”, providing to this day the most noteworthy of new data; on the one hand a great deal of the material is as yet unpublished, and on the other, it would be better in many cases to only speak of a “mentioning” or “pre-edition” as hardly a third of the approximately 80,000 conserved bulls have been given proper treatment. 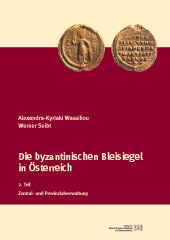 Based on the systematic catalogue of Byzantine seals in Austria’s public and private collections, an initial volume was published in 1978 dealing with the Imperial Court in a wider sense (Emperors, imperial families, functionaries at court and rank titles). The second volume published now is dedicated to the central and provincial administration, including the military and civil sector. The work offers many new insights not only in regard to the history of administration, but also in terms of prosopography. Following its aim to make further methodological progress, particularly with regard to establishing as precise a dating as possible and achieving more accurate identifications, much additional material was used, so that more than a thousand seals could be dealt with using the possibilities of modern sigillography.